Fast-forward back to today and not only do they not provide the full content of articles in their feeds (those clickthroughs and ad impressions being all-important), but not even their developer blog has been spared. This is pretty disappointing. My first thought was to run it through the nice full-text RSS feed creator at fivefilters.org but it looks like The Guardian have asked them to not allow this for their domain (damn those ads!). Luckily there are still tools out there which will convert their truncated feed into full text for me, so I was saved from having to write the relevant dozen lines of code myself, although maybe that was the point, eh developer blog? GDS has an absolute boat-load of repositories on GitHub, and no clear way to access or browse them. One of those repositories, govuk-developers, is an ordered index to those repositories, allowing you to find exactly what you’re looking for. This is a static site generated with Middleman and served from Heroku, except that you need a GDS login to be able to access it (presumably for cost reasons). In the description for that repo it says This project is being rebuilt and is undergoing rapid change. but there haven’t been any changes for nearly a week, so I’ve forked it. It’s now running in my Heroku account with no username and password (there’s a prompt, but just hit <ENTER>), so you too can browse the GDS repos and docs in a useful way. When Google Reader went away I raged and sulked and tried half a dozen services touted as replacements, but eventually I installed FeedDemon on the computer I used the most often and read my feeds daily, there. A few weeks ago I found the Newsfold app feed reader for Android, logged back in to my Feedly account and imported the OPML from FeedDemon. Since then I have been happily checking my feeds every day on my phone, more or less like I used to with the Google Reader mobile app. I only have a dozen or so going at the moment, but hopefully this will slowly step up and I will actually know what’s going on the world again without having to suffer Twitter. Congratulations to The Guardian for making me write a blog post. 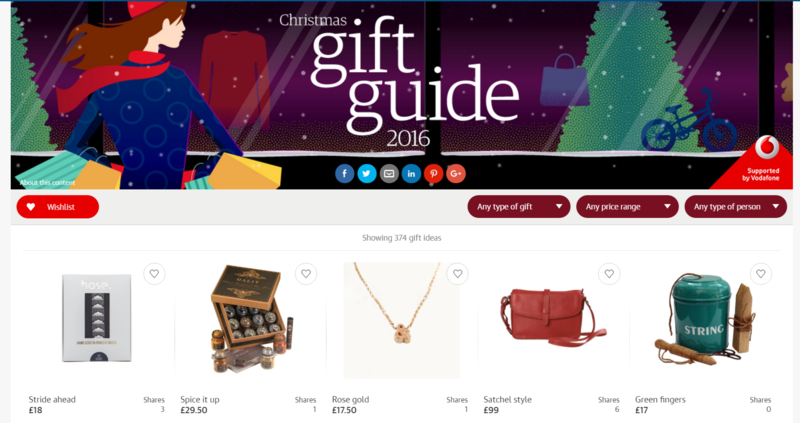 It’s coming up to Christmas, and like all newspapers The Guardian have a Christmas Gift Guide. It actually looks quite nice, with well-sized images, responsive layout, good filtering and obligatory animated falling snow. When I opened it there were a couple of items which I was interested in buying. So far, so Christmas. The whole thing is very similar to Amazon’s ‘stream’ app (“Interesting finds, updated daily”) for browsing items. The difference comes when you actually click an item. On both the Guardian and Amazon sites the page is dimmed and a modal display appears. This gives you more information about the product (Amazon’s one also has the decency to support pressing the Escape button to dismiss the modal), and a link to go through to the main product page. Except that on the Guardian app, that’s not quite what happens. Where Amazon’s pop-up display has a nice <a href="..."> for its link, meaning that you can open items in a new tab, send them to other tools, copy the link address and so on, the Guardian’s one has a <button>. A button with an attribute of data-target="...". This means that all you can do is click it and hope for the best. Will it change the location of your current tab, taking you away from the gift list? (no) Will it open a product page in a new tab? (yes) If you’ve already clicked one item in the list and then click another will it open another tab or replace the existing one? (it replaces the existing one – you can’t have two tabs with two different items open at the same time). As a user, this is incredibly frustrating, especially for something which I was so prepared to like.